The Mitzvah Circle is the highest level of Annual Giving that unlocks our treasure of spiritual, communal, social, educational, and philanthropic programs. 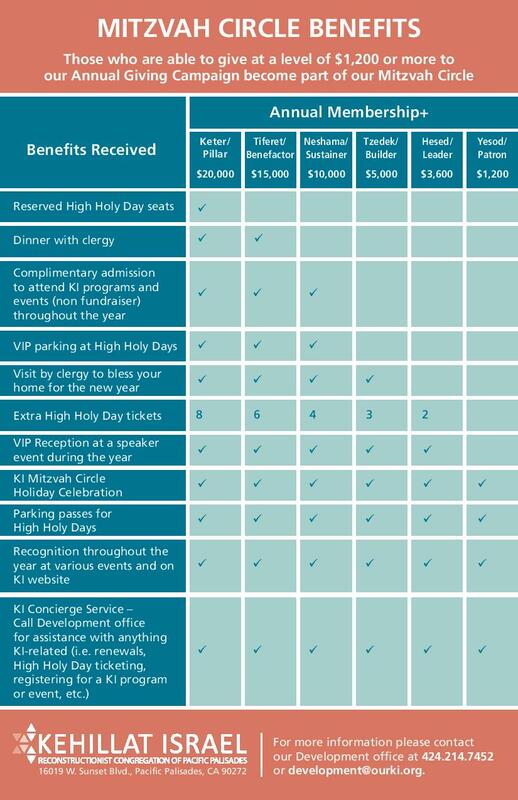 By donating $1,200 or more to our Annual Giving Campaign, your household automatically becomes a member of the KI Mitzvah Circle. To make your gift or discuss other giving options, please contact Scott Minkow, Director of Advancement, at sminkow@ourki.org or 424.214.7452. For information and other ways to give to KI, please contact Tricia Nykin, Associate Director of Member Engagement and Development, at tnykin@ourki.org. or 424.214.7463.